Thet Hsu Yi serves as an analyst at BGA’s office in Myanmar. She provides clients with in depth insights on economic and regulatory issues and key stakeholders in Myanmar. 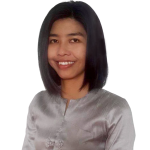 Previously, Thet Hsu worked at research firm Myanmar Marketing Research and Development (MMRD). She took part in numerous market research projects and policy research studies for international and domestic clients, during which time she gained considerable expertise in Myanmar’s business climate and the larger economic and political environment. During Thet Hsu’s time at MMRD, she conducted informational interviews with industry experts from the government, non-government organizations, and the private sector, expanding her network to include a diverse group of stakeholders throughout Myanmar. Thet Hsu earned her master’s degree from the Yangon University of Economics.